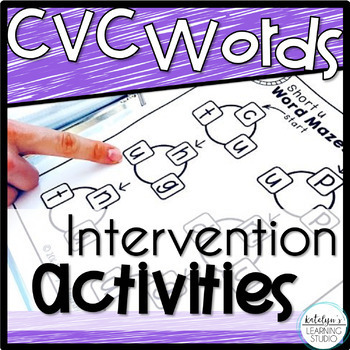 This CVC Word Binder is a reading intervention tool to help build and track CVC word decoding and fluency skills. 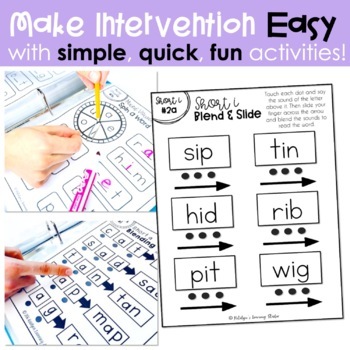 It covers CVC words with all five medial vowels and includes 65 assessment activities and 14 data tracking sheets. Each assessment activity is included in the data tracking pages for easy progress monitoring. Over 90 pages of everything you need to target CVC decoding skills! During guided reading, assessment, or intervention time, complete assessment activities with students. Keep track of their scores with the data tracking pages. You can create a comprehensive individual page for each student or just keep track of scores on the class data sheets. This works great as a class volunteer binder to have volunteers give students extra practice. You can use paper and pencil, or students can use dry erase markers if you laminate or use page protectors. 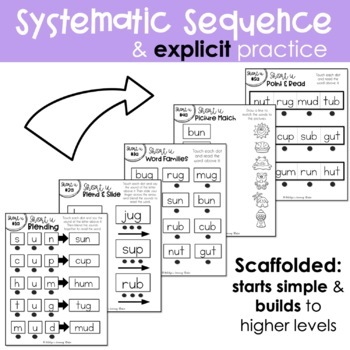 • Students will be able to blend sounds together to read short vowel words. • Students will be able to read a whole short vowel word with all 5 short vowels (a, e, i, o, and u). • New products in my store are 50% off for the first 24 hours they are posted! Follow me by clicking HERE so you don't miss any new products or sales.